Sponsored Content – In the wake of this year’s CES, one thing was made completely clear: 2015 will be the year that VR and consumers finally become fully acquainted. Of course, the early focus for VR has been on the gaming scene, but those who are following the industry are aware of the power it has to transform our lives in many other ways, including productivity and our education. One of the company’s working in that particular realm is zSpace, who have developed a revolutionary desktop VR solution specifically crafted for the classroom. The company has developed a platform that they believe will completely transform the way our children learn in the classroom. By making learning experiences that are as engaging as they are immersive, zSpace hopes to get students more interested in continuing to learn about the subjects they are studying, which they believe will translate to a greater depth in student understanding. Will Mason: How do you see VR affecting our relationship with computers? How is that change transformative? David Chavez: The fundamental value of VR is tied to the design and performance of the human visual perceptive system; our abilities of spatial cognition are enabled by amazingly complex neurobiological infrastructure. It’s obvious that our physical abilities to interact with the spatial environment are closely tied to our visual system—a significant percentage of our active hours include using our hands under guidance of the visual system. The most natural way we interact with our environment, which we do all day long, is to reach in and directly interact. Short of VR, our interactions with computers are nothing close to what could be considered natural. Given millions of years of evolution to perfect our perception of our volumetric world (consider the fact that essentially all complex life has exactly two eyes), why do we stare at 2D displays and indirectly wiggle a mouse? Much of what we see on 2D screens is perfectly suitable for 2D; however, much has been adapted, projected, reduced in information content, or otherwise artificially represented in a way that can be interpreted on a 2D display. We’ve just come to accept the limitations of today’s computer interaction models. We expect flat representations. We’d never think to reach a hand into a computer screen to grab, move, point, or rotate. That’s all fine, but it does not take full advantage of our abilities to interact with information. A VR system, if delivered with sufficient fidelity, allows users to take advantage of their spatial cognitive abilities in a way that is strikingly familiar, comfortable, and powerful. Such an environment is also virtual. In the virtual world, only our imagination limits the kinds of things that can happen. The application of computing technology, exponentially increasing in capabilities, can in a VR system be applied to take advantage of our abilities in a way that few people have experienced. Will: What does it take for VR to be “immersive” or as Oculus would say, what does it take to create “presence”? Dave: The “Reality” part of Virtual Reality is often overlooked. In order for a user to become immersed in the experience, the environment has to meet certain minimum criteria. Beyond that, it must be comfortable to use for long periods of time. Some of the early experiments in VR required bulky apparatus and even the latest Oculus Rift developer unit will put some serious strain on your neck. Visual comfort requires a fast updating display without flicker, minimal ghosting, and good contrast between lights and darks. Similar to a conventional display, the better the quality, the more impressive the image. An arbitrary rule of thumb is that a system will be comfortable at 60 frames per second (FPS), which in a Stereoscopic environment means that you must deliver 60 FPS to each eye. Between 40 and 60 FPS a system is still usable with minimal discomfort, however, dipping down to 30 FPS is where a user begins to notice. Below 30 FPS you will start to see the user compensate for the interface, which breaks the immersive experience. Other aspects of comfort and reality are somewhat obvious, but often ignored. For one, a user should be able to hold and move their head in a natural fashion. Humans are not robots, so any system that requires a vigilant posture, or one that breaks down if you happen to turn your head is neither comfortable nor immersive. Similarly the ability to naturally interact, that is, have your hand move in and out of a scene and the system respond intuitively is important. The slower the manual interface, the less comfortable and immersive it is. The less accurate it is, the less “Reality” in your VR. Finally, a good immersive system should encourage the user to interact with it. If the user reaches out to pick up an item in the scene, they shouldn’t have to wait for the mouse to catch up, nor should they be surprised by how the system responds. Much of this requires incorporating the concept of Natural UI into virtual reality in ways that were not traditionally done, learning the lessons from the mobile world. The other aspect is ensuring the system is responsive to a user’s position, motion, and interaction so as to be seamless. User perceived latency is the antithesis of immersive. Will: What makes VR so important? Dave: Virtual reality opens doors that would otherwise be impractical or impossible. You can explore complex or difficult concepts in a very natural, comfortable environment, visit locations that are otherwise inaccessible, examine endless biological objects or systems, as if they were floating in space, and view and interact with systems whose scales range from the atomic to astronomical. Beyond that it is also great for creation, you can invent and prototype endlessly, without the associated materials costs, experiment, practice, and train with impractical or dangerous materials or scenarios, and collaborate in ways that up to now have been limited to science fiction. It’s all extremely exciting. Will: Completely agree, there’s simply so much you can do with VR, the possibilities are truly limited to what we can imagine. So what makes zSpace’s system unique? Dave: zSpace has created a VR system that is centered around a desktop monitor. The primary system design objective is to deliver an immersive, comfortable experience. The user sits at a desk wearing lightweight, passive, polarized glasses. The display delivers full resolution HD images to each eye, and allows accurate responsive interaction with a stylus as the primary input device. The system tracks the position and orientation of head and stylus in real time. The graphics system renders images accordingly. The result is a convincing, responsive, and immersive experience that evokes a reaction of amazement and wonder. 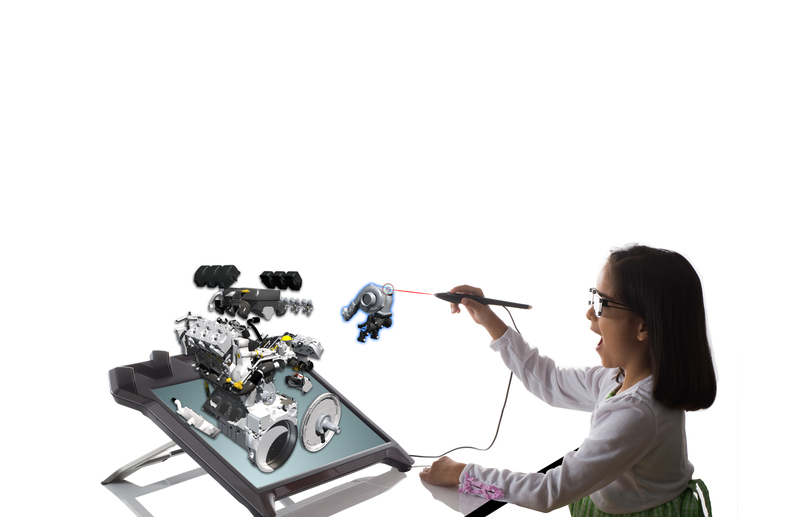 [As shown in the figure below] zSpace provides a highly realistic visualization experience that enables users to directly interact with virtual simulations as if they were real physical objects. Using a stereoscopic display, trackable eyewear, a direct interaction stylus, and an innovative software platform, objects in zSpace appear “solid” in open space, with full color and high resolution, and can be directly manipulated – giving users a natural way to navigate, grab, slice, carve, zoom, and explore 3D models as never before possible in traditional 2D environments. The key functionality of this new form of 3D visualization centers on comfort and ease of use. New users to a 3D virtual-holographic environment instantly grasp its most subtle concepts and act without thinking. By making the experience natural and seamless, the users are allowed to apply their creativity to the project at hand, rather than trying to interpret conventional 2D or 3D projections in their minds. Will: Where does the future of education fit within the VR space? What makes this medium so perfect for educational purposes? Dave: For the reasons I discussed before, the range of potential value of VR extends to a wide range of markets such as simulation and training, education, product design, healthcare, e-commerce, entertainment, and gaming. Common throughout the set of applications in those markets is the element of discovery; zSpace has leveraged the element of discovery in its first major target market of education. The obvious link between discovery and learning makes the classroom an ideal setting to take advantage of an immersive platform. Applications that help convey the concepts of Newtonian mechanics, biology, anatomy, electricity, and electromagnetism have been met with praise and excitement from students, parents, and administration. Teachers report two key factors that influence their students’ ability to learn with zSpace. First, students are more prepared for classroom teaching after being introduced to concepts in zSpace as the exploration and immersion lead them to ask questions about the topic; and second, the hands-on experience creates opportunities beyond what was possible with current tools, resulting in student excitement and engagement. The interactive environment allows students to explore and discover in a way that textbooks do not. Students have reported many learning impacts after their classroom experiences with zSpace. For example, they can learn faster by interacting with 3D objects because they don’t have to imagine how things look or are arranged, but they can see for themselves. They have also been able to learn more effectively as a result of being interested and able to use their intuition. Further, they can do things that are difficult or impossible in real life. For example, dissecting a beating heart, or instantly setting up (or cleaning up) a complex Rube Goldberg machine. All enabled by using our system. Will: That’s all pretty interesting, what have some of the responses been from the students and teachers that have had the opportunity to try zSpace, especially when comparing the experience to more traditional education methods? Will: That’s really cool, those “that was awesome” moments are what fuel me and the rest of the guys at Upload to keep evangelizing VR. I think a lot of people would agree with you about VR being transformative in the education world, what other markets do you see VR transforming? Dave: Education is one of many exciting application areas for a desktop VR experience. In the area of simulation and training, users can better understand safety, maintenance, and product training in an engaging, interactive way. Designers can simulate and model more accurately. Engineers can create incredibly realistic virtual prototypes. Desktop VR can be used to accelerate design processes and increase productivity through immersive visualization in manufacturing – including aerospace and defense, transportation and mobility, and industrial equipment markets. In research, such an environment offers opportunities for exploration and discovery in multiple arenas. For example, in drug development, researchers can manipulate representations of complex compounds more naturally in a stereo 3D environment than in 2D. Similarly, analysts can view and interpret volumetric data more intuitively. Top universities are also using zSpace to develop innovative ways to visualize and interact with data, conduct research, and change the way they teach. The key is that a great amount of information is best represented volumetrically; yet, prior to the availability of effective VR systems, data visualization, and interactivity has been artificially limited to 2D projections and indirect interactions. Medical information is a great example of data that is intrinsically volumetric in nature. Consider CT and MRI data, which are captured and stored in planes. Analysis of this data in planes is to abstract the volumetric nature of the data source. An alternative is to visualize the data in a volume, which is not only a more faithful representation of the nature of the data, but also allows clinicians, researchers, and patients to take advantage of their natural spatial processing abilities. Will: Well thank you Dave, that all sounds awesome. Do you have any final thoughts about zSpace and VR before we go? Dave: zSpace has established itself as the industry leader in desktop VR. The zSpace platform brings life to applications, giving developers and their customers new and unforeseen opportunities for success. With support for Unity3D, Ogre, and Unreal in addition to OpenGL, DirectX, C, C++, and Java, developers are equipped to quickly port or build their own immersive applications. We here at zSpace believe that the future of immersive technology truly lies in the hands of developers and killer applications. zSpace has turned Tony Stark’s [from Iron Man] interface into reality. This great power is now in your hands – please act responsibly. “With great power, comes great responsibility,” powerful sentiments. I hope you enjoyed this interview as much as I did conducting it. To learn more about zSpace, be sure to check out their website: http://zspace.com/. Or better yet, come check them, and 60+ other awesome demos, out at our event the UPLOAD World Tour Kickoff on January 16th at the Metreon in San Francisco. Be sure to use the promo code specifically for our blog followers: UPLOAD to receive over 25% off on your general admission ticket!